The ferry terminal in Fajardo, Puerto Rico. Sometimes getting to Culebra from Fajardo via ferry can be somewhat of a challenge. This is because of the popularity of the island, especially during weekends and summer. If you have been to the ferry terminal in Fajardo you have noticed that there are two lines. One line is for tickets to Vieques and another line is for Culebra. The line for Vieques is generally a lot shorter than the line to Culebra. In fact, it is possible that there will be nobody in the Vieques line while the Culebra line has close to a hundred people waiting for tickets. That being said, Culebra ferries are often overbooked early in the morning. The 9:00 AM ferry to Culebra is the most popular ferry. This is because many people are going to Culebra for the day. They want to spend as much time on the island as possible. With that being said, there are people that will arrive before dawn and wait in line. If you are arriving at around 7:00 or 8:00 on a weekend day, you may not get a ticket for the early ferry and have to wait in line for the next ferry, which is at 1:00 PM. A view of Culebra from the ferry. One tip is to buy your tickets a day or two in advance. If you are going to both Vieques and Culebra, consider going to Vieques first, or if you have rented a car, make a stop over in Fajardo a day or two before going to the island. You could do this when you are going to El Yunque National Forest for example. If you are camping, consider going to the ferry terminal to get tickets and spending a night at Seven Seas Campground. You can hire a publico or taxi from the ferry terminal to take you to Seven Seas for the night. 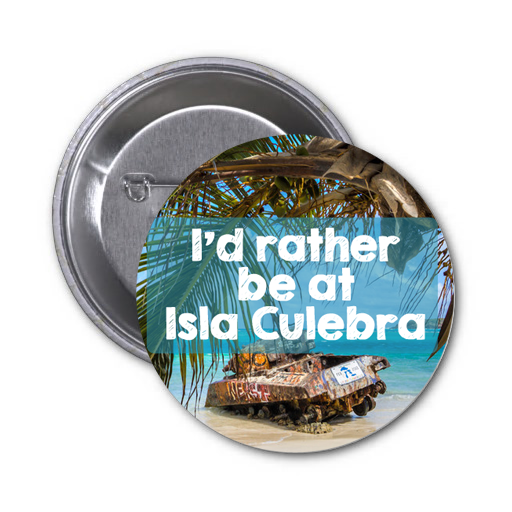 You can reserve your ticket to Culebra at a reservations trailer that is located near the regular ticket booth. If you need help finding it, just ask one of the local workers. A reservation can easily be purchased so you will not have to worry about the hassle of waiting in line on the day you want to leave. Many people are often told that they will have to wait until 1:00 PM as early as 8:00 AM. Sitting in line for five hours is not much fun, especially if your time is limited. Once you have tickets, getting on the ferry and taking it to Culebra is a snap. You will cross the street and wait in line for the ferry itself. The ferry is known as "Big Cat Express" and has three levels. The first level is indoor only, the second is partial indoor and partial outdoor. The third level is for standing only. The view of the islands as you make your way to Culebra is breathtaking. Without any adverse conditions, the ferry should take almost an hour to dock at the island once it pulls off from Fajardo. Sometimes the sea is rough and sitting up higher is recommended if you have trouble with becoming nauseous or getting sea sick. There is no eating on the ferry and the guards will make sure you don't try to slip a cracker, so be warned. There is plenty of food at the ferry terminal for when you are waiting for the ferry. There is a small restaurant a block away if you are waiting for a while, or you can take advantage of William's Pizza, which is located in the ferry terminal. Generally there are vendors outside selling more local items, such as breads and sometimes ice cream and water. In the mornings a doughnut man will sell donuts from his truck.